Stunningly simple, very flavorful. We love this salad, although it's difficult to find the fresh red chilies around our market, but when I do find them I immediately dig out this recipe. I have added thinly sliced spicy sausage, I had something like this in a Thai restaurant and they served it with the sausage giving this a sweet and hot flavor, more of an appetizer than salad. Try it you wont be disappointed. 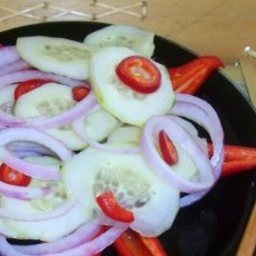 Arrange cucumber, onion, and pepper in layers in serving bowl. Mix vinegar, sugar, salt, and hot water together - stirring until sugar is dissolved. Pour liquid over cucumbers and serve.